"Download Virus Checker" provides automatic check for all your downloads through 68 online anti-virus solutions. 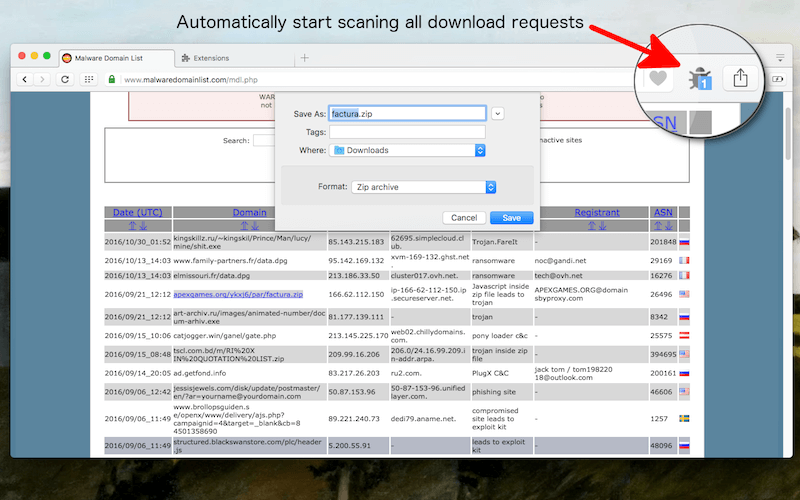 Basically the extension sends your download link to VirusTotal service and wait for its response. If number of positive responses is over defined number (default is 3), a warning window pops-up with information about the link. A complete list of scan reports provided in this window as well. What is "Download Virus Checker" extension and how does it work? The extension requires zero configuration after installation. When a new download is requested, its original link will be scanned through 68 anti-virus solutions. If the report is clean, nothing happens. However, if some of anti-virus solutions report positive, a warning window is displayed for your attention. Information about the report and download link is displayed in this window. Note that this extension is not going to cancel your download. It is going to display the warning window. It is your responsibility to cancel the download or delete the local file. What is the condition to display the warning window? Normally each download is checked against 68 anti-virus solution. When there are more than 2 positive reports, you will get the warning window. The number of total positive reports is adjustable from the options page. Is "Download Virus Checker" extension going to check all the downloaded links? It depends on the mime types. For instance by default "audio", "video", "image", and " text/plain" mimes are ignored. The list of white-list mime types are configurable from the options page. Why does "Download Virus Checker" extension take so long for a single virus check? The core API behind this extension is VirusTotal. VirusTotal allows 3 requests per one minute. Each link checking requires at least two API calls (one for submitting the link and the other one to fetch report) which means each check at least takes about 20 seconds. The next job is queue for 40 seconds after the first one is requested. Is it possible to check a link first then start downloading it? Yes, use right click over the link and select "Save Link". A save dialog is displayed asking for local file-name. Once this dialog is shown, the link is already added to the queue list and badge number over the toolbar button is incremented. Wait until the badge goes back to zero. Once it is zero, it means there is no ongoing scans and hence the link had no security thread. At this point you can click on the save button to actually store the link locally. Is it possible to abort currently queue list? Yes (currently on Chrome and Opera only), click on the toolbar button for the desktop notification to appear. Clicking on this notification cancels all the ongoing scans and resets the extension.